Monday morning markets are usually quiet but this morning they have all been very jittery following last week’s sell off as the FTSE 100 & NASDAQ ended October almost 2% down in October. This weekend’s news that another US Bank (CIT) has filed for Chapter 11 in a high stakes plan to stay open while it attempts to restructure has not given the markets any confidence. 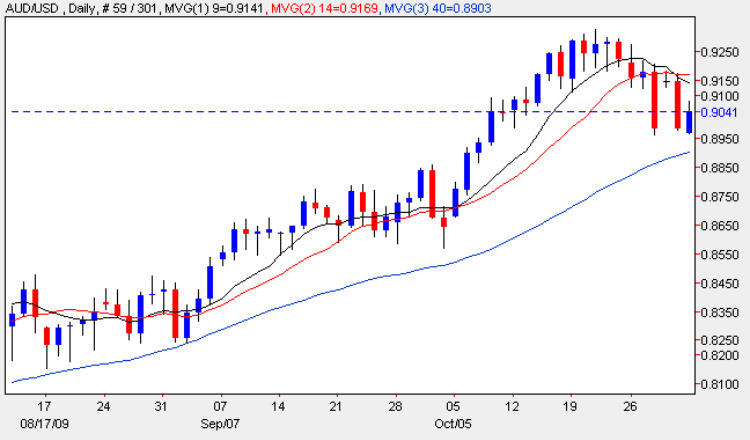 This has thrown many traders and investors into panic with demand for yen which has soared against the dollar, sterling, euro and Aussie dollar. However, with positive noises about the Australian economy and better than expected house price data caused an immediate “volte-face” – all this before the trading week had started!! With markets reacting (and over reacting to almost any piece of fundamental news) trading will be tricky. The Aussie has had some wild moves in the last few days and has already shown some fighting spirit today. The AUD/USD is up 0.5% while the AUD/JPY is up 0.4%. Either of these forex pairs could be at the centre of the action today and could be a good avenue for bets as markets continue to thrash out a consensus.